The ride officially got under way from Moscow, Ayrshire, on Sunday, 12th June 2011. The Wee Riders arrived safely back in the UK on Tuesday, 12th July, exactly one calendar month later. 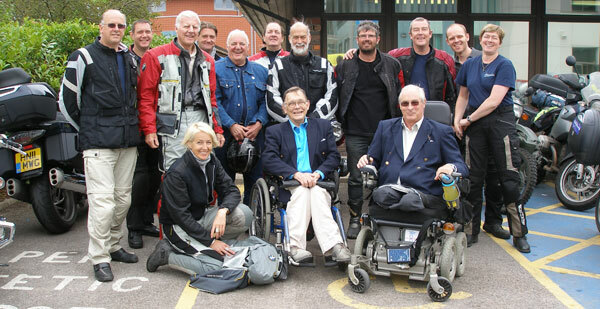 They were joined on their ride to a Reception at the National Spinal Injuries Centre at Stoke Mandeville Hospital, by HRH Prince Michael of Kent and several guest riders. Also attending the Reception were Poppa Guttmann Trust Chairman, Michael Mackenzie, and Trustees, Philip Lewis and Dr Alison Graham. Buckinghamshire Healthcare NHS Trust Chief Executive, Anne Eden, welcomed the riders on behalf of the Hospital. The route to Moscow (Russia) and back, took the riders from Scotland through England, France, Belgium, Holland, Germany, Poland, Lithuania, Latvia, Estonia, and Russia, returning to the UK via the Ukraine, Poland, Germany, Belgium and France: more than 6,500 miles. The riders completed their round trip on Wednesday, 13th July, when they arrived back in Moscow, Ayrshire. A Welcome Home reception was held in their honour at the offices of East Ayrshire County Council the following morning. Figures have yet to be finalised, but it is believed the ride raised in the region of £14,000 for The “Poppa” Guttmann Trust. The riders were entirely self-funded. Please visit our “Good Guys” page to see how businesses, large and small, contributed to our success. The Charity’s aim is to celebrate the life and work of Sir Ludwig “Poppa” Guttmann, founder of the National Spinal Injuries Centre at Stoke Mandeville, and father of the modern Paralympic games. Money raised from this ride will support the Stoke Mandeville Centre including an innovative arts programme at the Hospital to help recently-paralysed patients improve fine motor skills while, at the same time, fostering creativity and a sense of achievement. Looks fascinating and a great way to raise some funds for a good cause. I’ve added to favourites and will watch for developments on the website; will donate early next year-that’s a promise! Thought I’d look in on the website after talking to you this evening, it all looks terrific and very exciting. Wish I could ride a bike! Anyway, I’ve had a couple of ideas for raising awareness that I thought I would run by you, so will give you a call in a couple of days. Also my brother in law Vic is a very keen motorcyclist, and knows lots of like minded folk who may be up for a challenge? You never know! Can you send Vic’s email address, the whole story is beginning to take on a life of its own, mention the 60’s motorcycling legend Peter Williams to Vic and ask him to get in touch. Incidentaly, which Margaret am I talking to? See I have looked like you asked and think its great. I will keep looking to see how you get on. What a fabulous charity to support and what a marvellous way to so do. I will most certainly do all that I can to help. Good luck on yoru ride and raising awareness of the success story at Stoke Mandeville. Hopefully the brothers will all support your efforts. Let me know if there si anything that I can do. Hi Jackson, a very valid question and perhaps something that I should have made clear somewhere on the site. The riders are entirely self-funded. None of the money raised will be used to fund the ride, though we have had our Eurostar tickets donated and have been offered ‘help’ with the cost of visa applications. Even so, the trip is costing each of us an arm and a leg – with hotel costs in Russia being particularly expensive. John and myself are no strangers to long-distance m/c touring and, from that point of view, we have a rough idea of the likely overall costs. On the other hand, we are looking at this ride as a once-in-a-lifetime experience and, if we can raise some money for a good cause, so much the better. The aim is to raise £15,000 for the Poppa Guttmann Trust. With two months to go until our departure, we have achieved £5,180. So it’s looking promising so far. Writing this on your departure day. Donation duly made. All the very best to you and your gang. Thanks a million from Jim’s team. The Waltham St. Lawrence event was a huge success. I believe we raised something like £1900 – not counting sponsorship pledges! Good to meet you all at the Ace last night. I can see from the tracker that you’ve made it to France – well done!